Winter is the down time regarding practical outdoors work at the volunteer centre. There’s a few good reasons for this; the weather can be too harsh to expect the often inexperienced groups we work with to spend a day working outdoors and at times in the past has prevented people getting here at all. On top of this, the cold and wet conditions mean the ground doesn’t recover well from having large groups of people trampling around on a work site. We make the most of this time to do lots of painting and decorating and minor maintenance on the buildings and also look back on the year just gone and plan for the year ahead, making sure we have suitable jobs lined up for everyone. That quiet period only lasts for the worst of the winter though and for the last couple of months we’ve been tackling low level conservation tasks like woodland management and hedgelaying. But now spring is getting a grip we’re gradually starting to head further up into the hills, having recently had our first fell working day of the year. And what a great way to start the fell season it was. In advance of their own summer season Basecamp was hosting the Icelandic environment agency’s annual training week for new and returning leaders on their path repair programme. As most of their leaders come from the UK they hold this at Basecamp, rather than on Iceland. It also helps that we are significantly further into spring than Iceland! This year we teamed up with volunteer development ranger Matt and the North Lakes upland path team to give the Icelandic leaders a chance to learn and practice pitching on the Boredale Hause path. This isn’t a technique they have employed much in the past, but much like the Lakes, they are finding increasing visitor numbers is putting greater pressure on their path network and therefore requires more robust solutions than the much lighter touch work they have applied in the past. Much like our regular summer upland blitz this was a good chance to swap ideas and stories with people involved in upland path work in a different place and realise that they are facing many of the same difficulties that we are. The path working world is a small one really! Now that has started us off we are looking forward to our main projects this season, which will see us return to Martcrag Moor to continue with the sheep fleece path and in combination with the South Lakes upland team working on the very popular path on Wansfell, near Ambleside. 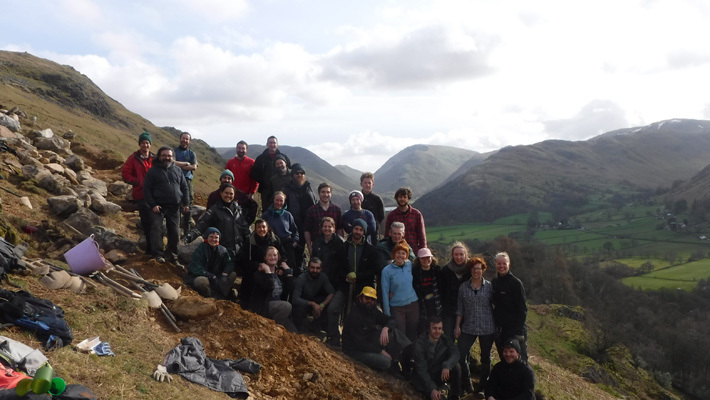 Before that though, we have a weekend coming up with the Fix the Fells volunteers where we will be landscaping and re-profiling a very deeply eroded path on the low fell Lingmoor, above Little Langdale. This job is likely to be similar to the one tackled a couple of years ago on Tongue Gill, for the lengthsmen’s 10 year anniversary celebration. At the time we were implementing a relatively untried technique, but having popped back up there for a look recently we were amazed by how well it has worked. 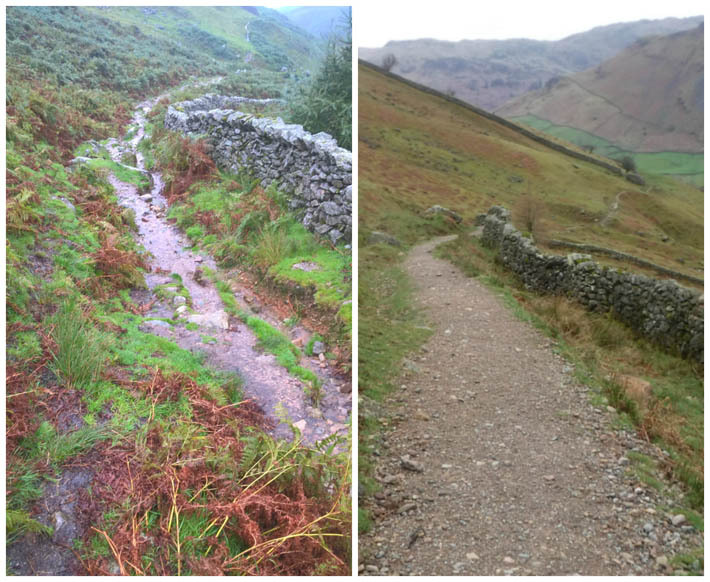 Not only has this given us confidence for the Lingmoor job but it was also lovely to see how completely this previously badly scarred path has healed up. Of course, the majority of walkers on this path won’t have any idea of the work that went into making it so inconspicuous, but that’s one of the dilemmas of path work – you don’t want anyone to notice it, but we do need people to understand that it doesn’t just look after itself.